It was kind of a big day! 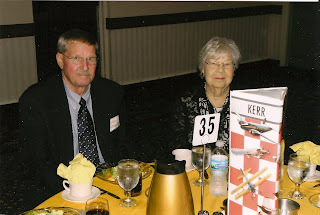 On April 24, 2010, Fujiyama Trays & Oshibori Towels won the 2009 Minnesota Aviation Hall of Fame (M.A.H.O.F.) award for best aviation writing by a Minnesotan in 2009. Noel Allard, Executive Director of the MN Aviation Hall of Fame, is shown above presenting the award to yours truly. At the podium is Tom Schellinger, Chairman of the M.A.H.O.F. who nominated the book and introduced me. Top: Brother John Billingsley and I at my table. 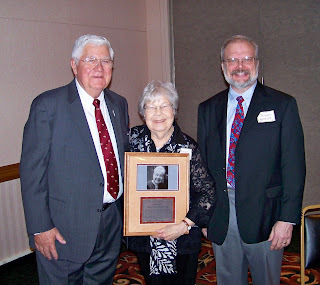 Below: Tom Schellinger, Anne with plaque, Roger Gomoll, sponsor of the writer's award. It was a festive evening. Over 400 people, a virtual "Who's Who" in Minnesota Aviation, were there; from the F.A.A. to the Civil Air Patrol, E.A.A., general aviation fixed base operators, U.S. Weather Bureau, representatives from commercial, airline and military aviation, as well as aviation historians. It was a singular honor and one that I am deeply grateful to have received. 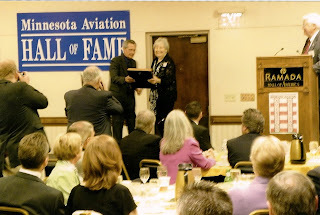 Thank you, Minnesota Aviation Hall of Fame!